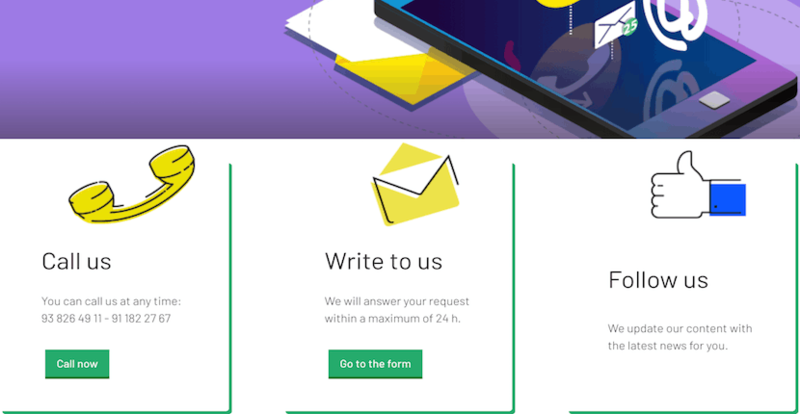 cdmon Review 2019: Is cdmon a Good Hosting? Spanish web host, cdmon, offers cloud-based NVMe SSD hosting along with SSL and domain registration. It offers a free Micro hosting plan with any domain registered. Formed in 2002, cdmon is a Spanish web hosting provider offering shared SSD cloud, VPS, and dedicated server hosting along with SSL and domain services. It has helped customers with over 10,000 web projects and has 70 employees. The company is based in Barcelona, Spain and its website is in Spanish and English. Hosting with cdmon features Intel NVMe SSD storage and is customizable in terms of storage space, monthly data transfer, and email accounts. However, several plans are available including the Junior, Senior, and Master plans. The Junior plan includes 5GB storage, 100GB monthly data transfer, 10 email accounts, and 512MB MariaDB storage. Two hosting plans exist below the Junior plan that may be worth noting. The Start plan features 2GB storage, 50GB monthly data transfer, one email account, and no database or CMS support (no WordPress, for example). Additionally, cdmon offers a free Micro hosting plan to anyone registering a domain. This Micro plan features 50MB storage, 1GB monthly data transfer, and one email address with 100MB storage. This plan also does not include any databases, or CMS support. As stated, all cdmon hosting uses Intel NMVe SSD drives. These flash memory-based hard drives offer much faster performance than HDD or typical SSD storage; up to 4x typical writing speeds and 10x reading speeds. The drives also utilize PCI Express connectors for increased performance. 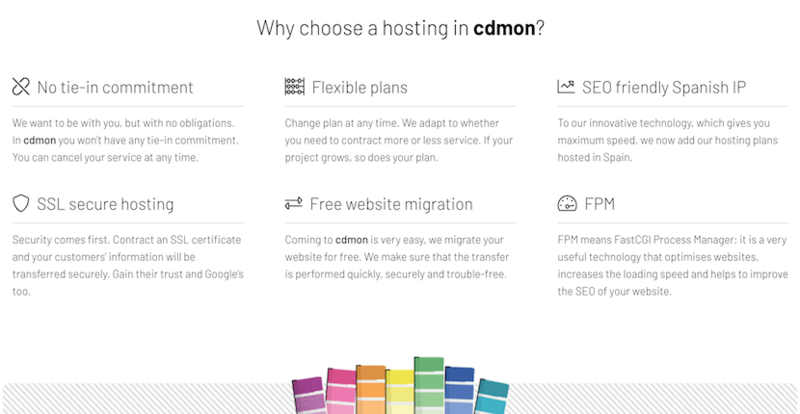 Hosting plans with cdmon include a free Let’s Encrypt SSL certificate, but customers are also able to purchase upgraded SSL certificates. These paid options include: RapidSSL, RapidSSL Wildcard, True Business ID, and True Business ID + EV. The True Business ID evaluates your entire business and the True Business ID + EV will display a green address bar as a visible display of your website security. All cdmon hosting plans includes free use of its custom control panel. This is a secure system with access via SSL security protocol. The control panel includes search with multiple filters and instant modifications of any changes made. Pricing for cdmon hosting plans is competitive and comparable to other European and international providers offering premium SSD cloud technology. The Micro plan is free with any domain purchase and includes a minimal amount of data and features for a small static website. The entry-level paid Start plan is priced in line with competitors’ entry-level offerings, however doesn’t offer any database support. To get a full-featured plan appropriate for WordPress, for example, you’ll need to step up to the Junior plan. Most of cdmon’s hosting plans can be purchased quarterly, semi-annually, or on a yearly basis, with the Senior plans or above available on a month-to-month basis as well. Semi-annual plans offer a 10% discount over monthly and yearly subscriptions yield a 20% discount. Customer service is listed as available round-the-clock via telephone and email ticketing. I reached out to customer service with a sales request but didn’t hear back within the few days leading up to this review. Competitively-priced and full of advanced features, cdmon hosting ticks the right boxes for performance hosting in Europe. Its plans feature fast NVMe SSD storage and free SSL certificates. Get faster SSD hosting with cdmon. Wondering how cdmon stacks up against other Web Hosting companies? Enter any other Web Hosting company and we will give you a side-by-side comparison.